October 28, 2015 – NASA’s TIMED mission, short for Thermosphere, Ionosphere, Mesosphere Energetics and Dynamics, has confirmed a surprisingly fast carbon dioxide increase in Earth’s upper atmosphere, raising questions about how different layers of the atmosphere are interconnected. In its 14 years of data collection, TIMED has also observed a much faster increase of carbon dioxide above the Northern Hemisphere even though climate models predict carbon dioxide should increase more or less equally across the globe. Understanding the way carbon dioxide moves throughout the atmosphere is key, both for making accurate climate models and for planning spacecraft flight paths. Though carbon dioxide raises temperatures near Earth’s surface, it actually causes cooling in the upper atmosphere, reducing air density in these outermost reaches of the atmosphere and impacting spacecraft orbits. This study, published in Geophysical Research Letters on September 5, 2015, uses 14 years of data from a radiometer on board the TIMED satellite, the first satellite capable of making long-term measurements of carbon dioxide concentration in the upper atmosphere when it launched in 2001. Carbon dioxide is being poured into the atmosphere by human activities, like the burning of fossil fuels and deforestation. A 5 percent per decade increase in carbon dioxide concentration in the lower atmosphere is confirmed by some 56 years of measurements at Earth’s surface. But in the upper atmosphere, the increase in carbon dioxide concentration was observed reaching rates of 12 percent per decade around 70 miles above the surface. Furthermore, they discovered that the carbon dioxide in these upper layers, long thought to follow the same patterns across the globe, is increasing faster over the Northern Hemisphere. Though the Northern Hemisphere produces much more carbon dioxide because of its greater land area and population, scientists expect the difference to become negligible at such great heights due to diffusion and mixing. This study’s result also confirms a second set of data from a satellite with capabilities similar to TIMED — the Canadian Space Agency’s SciSat-1, launched in 2003. 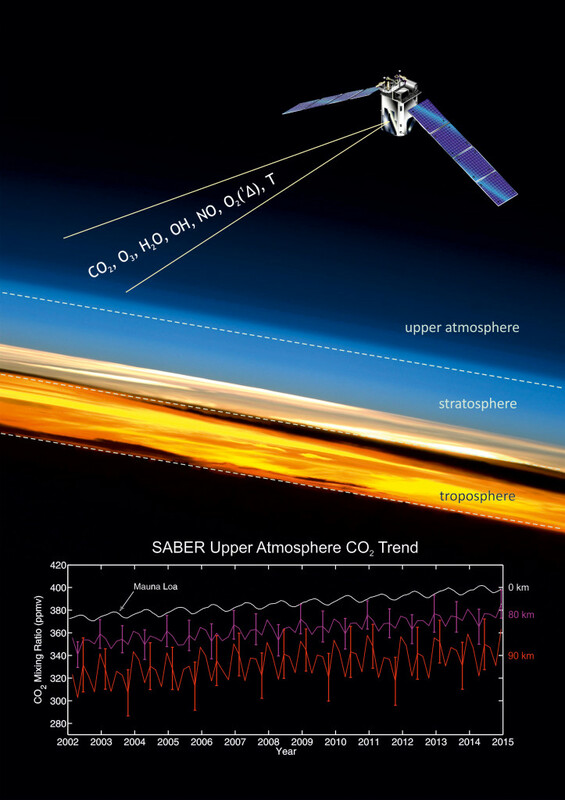 An analysis of eight years of SciSat-1 data gave the first indication of the accelerated increase of carbon dioxide in the upper atmosphere. “The support between observations by TIMED and SciSat-1—which use different remote sensing techniques to detect carbon dioxide—confirms that the quick increase is a real, physical trend, and not an artifact of any instrument or data,” said Yue. Identifying these unexpected trends was only possible because of the long lifespan of TIMED’s radiometer, which is still operating well. The TIMED satellite, originally slated for a two-year mission ending in 2003, has been granted six extended missions. TIMED’s current mission is set to end in 2017, but scientists are hopeful that data collection will continue. The Solar Extreme ultraviolet Experiment (SEE) was built at the University of Colorado and continues to take daily measurements of the solar extreme ultraviolet (EUV) radiation. Tom Woods is the Principal Investigator for TIMED SEE.